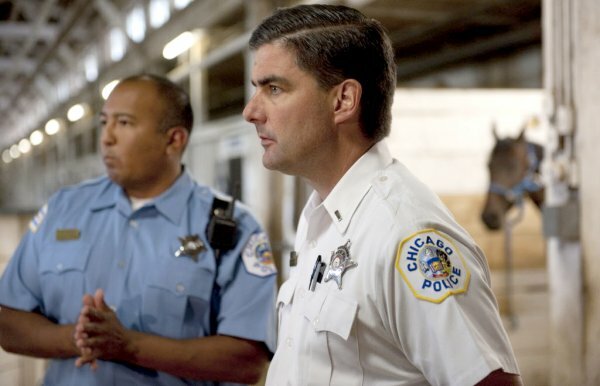 Sadly, Chicago’s soft-on-crime policies led to the death of Police District Commander Paul Bauer (pictured above) in downtown Chicago Tuesday afternoon. A career bad guy, wearing body armor and carrying an illegal gun in the heart of Rahm's paradise, ran from police. Minutes later, Commander Bauer saw the suspect. Even though off-duty, he sprang into action to help his fellow officers and to protect his fellow residents. After some shouting, witnesses say the offender produced a gun and fired as many as five times. Not long after, the officer was pronounced dead at Northwestern Memorial Hospital. Hello Illinois General Assembly, and the Cook County Criminal Justice System: His death is on your hands. On your watch. Our state's political leaders lack the will to put career criminals in prison and keep them there. And because of that, some ne'er-do-well stole a good man's life. 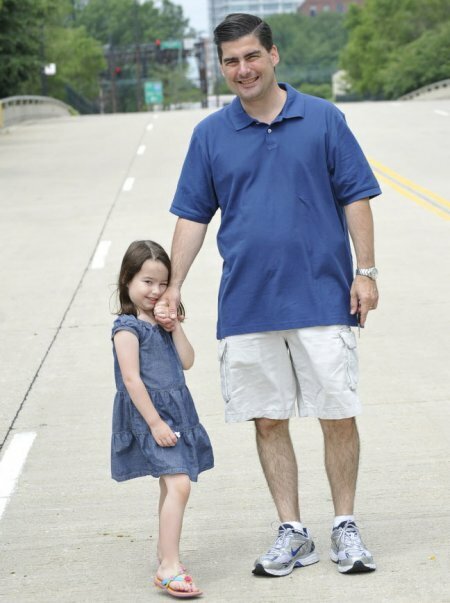 And on the eve of Valentine’s Day, his little girl lost her dad and his wife lost her husband. Actually, the day's events all began in 1998. Police report that the suspect had a long felony record which included gun charges, armed robbery and unlawful use of body armor dating back to last century. Go figure, right? Yet despite those convictions and Illinois’ strict gun control laws, this predator still prowled the heart of Rahm’s paradise with a pistol while wearing body armor. Another man, named Willie, previously convicted for numerous burglaries, was caught but allowed back on the street three days later, electronically monitored, such as an ankle monitor, while waiting for court dates. …In August, Chief Judge Timothy Evans replaced all the judges who presided over bond hearings in Cook County and directed new judges to set bail in amounts more affordable to defendants. This is at odds with Chicago police, who would prefer to see higher bail amounts for career criminals. Bauer also publicly criticized the Cook County Sheriff for emptying the jail of bad folks. It is frustration police deal with every day as they try to make communities safe, says Bauer. Indeed. Most of Chicago PD’s brass love to blame the ever-popular “guns” for the violence and crime in their city. Then again, most of the brass owe their positions and future promotions to politically connected people. Obviously Bauer was not one of those. "Anyone who can remember their teenage years or knows a teenager knows teens are impulsive. They don't think of the consequences of their actions," Preckwinkle said. "Knowing about teenage behavior told us that it was the right thing to do, to create a separate system to keep juveniles focused on rehabilitation for everything except the most serious crimes." And State Senator Kwame Raoul of Chicago was a driving force in Springfield, telling the Tribune. "We need to shift to a more individualized assessment of an offender," said sponsoring Sen. Kwame Raoul, D-Chicago. "Anybody who is charged and convicted is not the same as someone else charged. The facts are different, the background is different, the culpability can be different. So when you tie a judge's hands, the judge can't say if this kid would be better served if kept in juvenile court." No, Kwame and Toni. Commander Bauer's death is on your hands. This entry was posted on February 14, 2018 at 10:38 am and is filed under Blog. You can follow any responses to this entry through the RSS 2.0 feed. Sounds like the thug was just looking to murder someone. Bring the back the death penalty. Chicago politicians can't lock them up for too long, they need to be out to vote for democrats. The above post should be required-reading for the Illinois Gen. Assy. as well as the entire legal community of Cook County ! Letting violent offenders out early is a tragic mistake that keeps happening ! I feel the loss of officer Bauer is partially on the hands of Liberal judges, Lawyers, and law-makers who let this travesty of "Justice" continue ! Jail costs 143/day per inmate. Theres 16 THOUSAND BEDS at cook co jail. Daily population is down under 4000.
the savings of letting these assholes run around loose. The electric chair should be so busy that the lights in my house flicker. I am going to comment something that is going to offend a lot of people. So be prepared to get upset. When i was a child i never even heard of nonsense like this. Career criminals, gang bangers, drug dealers and terrorist. I never heard of any of this nonsense. But when i was a child the borders weren’t wide open and the USA was basically a Christian nation. 90% of the people were also one color. Today the news is full of hate, violence and more hate. People that i have never meet nor do i know are claiming they support violence if you supported. Trump, Believe in God, own a gun or your white. My opinion our problems are cultural and not a matter of law enforcement. Multiculturalism does not work. We are not one people under God, but a Godless nation, Where liberalism and communism runs amuck. Gun Control is not the answer either! May God Bless Commander Bauer and comfort his family through their sorrows. Not a whole lot of difference than what we have right here in Champaign County, with our lovely state's attorney. Light sentences, probation, or just a slap of the hand is her legacy. How many have we seen killed here recently by thugs that would have been in prison if not for her? It's time to end this liberal Democratic thug hugging nonsense. It's time to end political correctness. Call it like it is, the poor black segment of society is out of control. The violence rate amongst black makes is staggering. They account for less than 6% of the population, but black males account for the majority of the murders and violent crime in this country. Think about that for a second. And the police are the problem according to Barack and Michelle? The black caucus only perpetuates the dependency and poverty of the black population in order to stay in office. They could care less about their people. Look how they are sucking up to Pritzker even with his recorded racist talk. Why, because all they care about is enriching themselves. We need a change in this country, everyone needs to be held accountable for their actions. The laws need to be enforced, and criminals needs to be put away longer. Cook county courts is a joke. Fox is a joke, preckwinkle is a dangerous racist joke , Rahm needs to be kicked to the curb, and all the affirmative action command staff in cpd needs to be removed. What happened to the American dream? The best person for the job. Period. Whoever that may be. We have lost our way in this country.